“Oh, Chanukah, oh, Chanukah, let’s light the menorah” … and so goes one of the most popular tunes sung during the Festival of Lights, which begins this year on the evening of Nov. 27 — yes, just in time for Thanksgiving day. This anomaly for Jews in America will be a once-in-a-forever moment, which leading Jewish authorities say will never happen again. The Jewish calendar runs off a lunar model and is slowly getting out of sync to the tune of four days in 1,000 years. So, for this to ever happen again, the Jewish calendar would have to be “reset” to correct what has been happening for millennia. So, everyone can enjoy sweet potato latkes (pancakes) this year with a dollop of whipped cream on top! The holiday lasts for eight days, and will end on the evening of Dec. 5. Like all Jewish holidays and the Sabbath, Chanukah will begin at sundown and end at sundown. In a quandary about what to give as a present this year? Don’t dismay! We’ve got a host of unusual gifts to share with your loved ones. They can be homespun, domestically produced or hail from Israel. One of the best gifts that people enjoy is getting a new menorah. 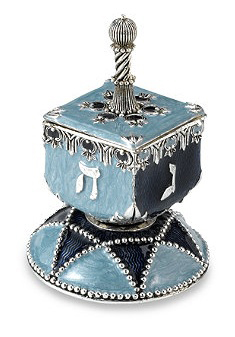 This Judaic religious item is used when lighting the candles throughout the season. And, many of them are so lovely or eclectic that they can be seen adorning shelves throughout the home. North Carolina artisan Sue Treuman from Chapel Hill has been crafting a series of menorahs for decades. These are handmade pottery pieces and are available in limited quantities. I have one of her earlier womanorahs (great for lesbians) and love it. There is also a male version of it, the manorah (super for gays). Red Sky Gallery, 1523 Elizabeth Ave. #120 in Charlotte, has some of them on hand, along with some other varieties that will complement any decor. Shoppers may also find others online at a number of sites. Of course, menorahs are available in both traditional and contemporary versions across a wide range from sterling silver, brass, wood, ceramic, cloisonné and more. Another popular item is a dreidel. This spinning top is used to play a game, but can also be used as a decorative item. They come in plastic or wood for under a dollar up to several hundred for handcrafted pieces. Bed, Bath & Beyond has some for under $100 like the one shown here. For children, why not try a cuddly teddy bear? Bed, Bath & Beyond has this adorable one for $20. Many local synagogues have Judaica shops where they sell a plethora of religious items, jewelry and more. 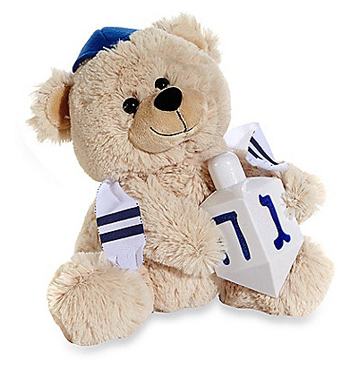 Temple Israel, 4901 Providence Rd., is open Sunday and Tuesday through Thursday from 10 a.m.-1 p.m. and Friday from 11 a.m.-1 p.m. Temple Beth El’s Discovered Traditions Gift Shop, 5101 Providence Rd., is open Monday through Friday, 10 a.m.-3 p.m., Friday night before and after services and Sunday during religious school days. Both offer a complete line of merchandise from elegant to contemporary. 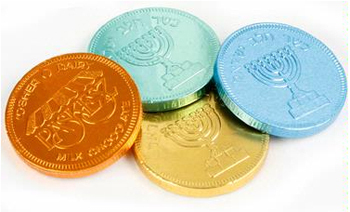 No Chanukah is every complete without gelt (money) and the best way besides the kind that goes into the bank is to enjoy foil-covered chocolate treats made to look like coins. They come in gift packs, in netted bags or loose. Talking about treats, be sure to enjoy some donuts, holes or jam-filled delights, a customary tradition throughout the world. Pick up a dozen or more from your local Krispy Kreme. The ingredients are Kosher certified through their mixing plant in Winston-Salem, N.C.